On a whim last week, a colleague, architect Florian Idenburg, and I boarded a train headed for Philadelphia. We cobbled an itinerary together: Stefan Sagmeister’s “The Happy Show” at the Institute of Contemporary Art and the much ballyhooed and controversial reopening of the Barnes Foundation. “The Happy Show” left us depressed and the new Barnes Foundation is a cauldron of art, class, and politics that I will leave for others to stir. What did make us happy was a “neighborhood beautification project” steered by the duo Haas & Hahn. Renowned for their large-scale, community painting project in Rio de Janeiro’s Santa Marta favela, their work was featured at Storefront for Art and Architecture in May 2011, during the New Museum’s Festival of Ideas for the New City. 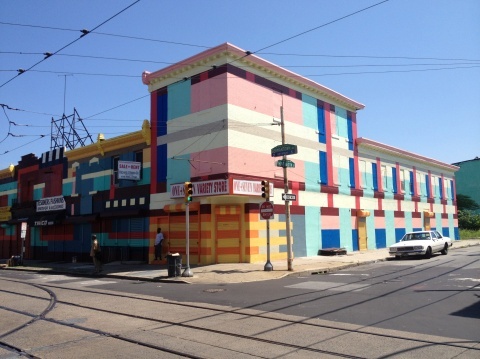 Invited by Mural Arts to work on the project, Jeroen Koolhaas and Dre Urhahn have been living in Philadelphia for almost a year, near the commercial corridor of Germantown Avenue. 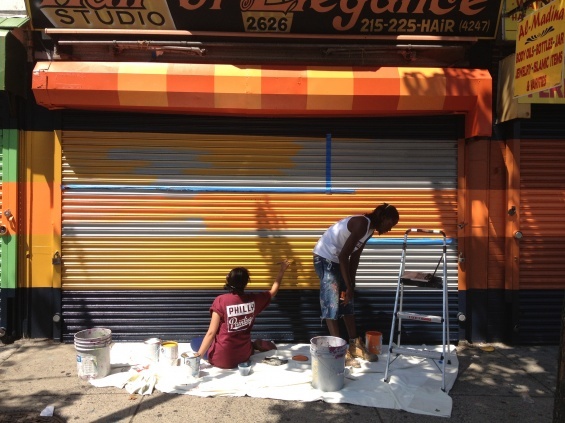 Their objective is simple: engage with the landlords on four blocks of this once-grand street in an artistic process and teach mural painting skills to the local youth in order to transform unsightly real estate into an attractive cityscape. Koolhaas, who leads the design direction, took thousands of pictures of Philly and from these images culled the city’s color wheel. Thirty-five palettes were developed and then presented to each of the landlords who discussed the balance and weaving pattern that would configure their respective buildings. While the metaphor of urban tapestry is rather literal, the results are a complex geometry that reflects the process, people, and place. Mural and street art have been vibrant forms of art making for decades. The social anatomy of these practices has recently been amplified by the soap opera that emanates from Shepard Fairey’s press machine and the unconventional anointing of the street artist JR via the 2011 Ted Prize, followed by the apt artist profile in the New Yorker. What sets Haas & Hahn apart is the lack of vanity and the willingness for a collective vision through abstraction. They live where they work. They have an open studio policy—neighbors can drop in on them anytime to debate the design and get them to discuss their intentions. Their door-to-door campaign, to first gain the trust of the community (from gang leaders to council members), and then a painstaking engagement convincing landlords to give over their walls for the public good, is a small miracle in itself.